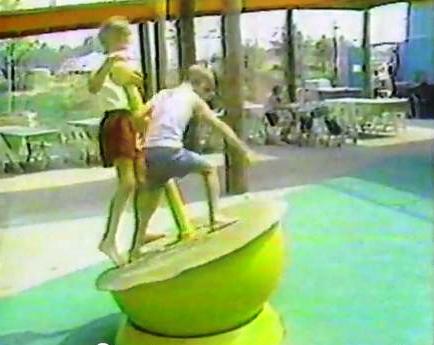 The Balancing Buoys was listed in a 1982 (Texas Sesame Place) news article as "The Balancing Bouys (sp) - By shifting the center of gravity, guests become human pop-up toys. I assume there were several of these, possibly in different colors. The one in the image above appears to have a Big Bird head attached to the pole in the center. Perhaps they had different ones with different characters. Update: A closer look at the image below reveals that The Balancing Buoys were next to Big Bird's nest in the area where Crystal Climb opened in 1983. This means this attraction probably was moved over to Texas for it's 1982 opening.